John Pollock and Wai Ting review WWE SmackDown from Phoenix, Arizona. 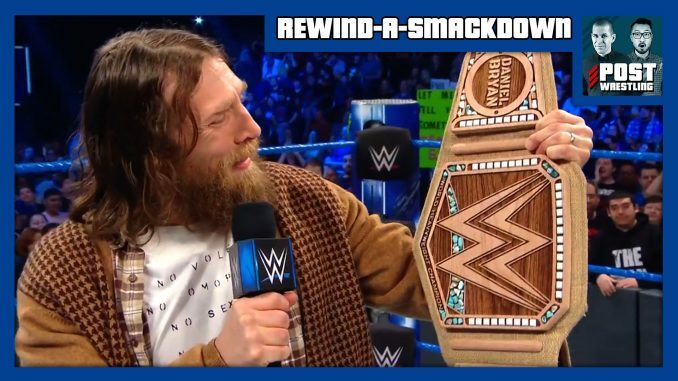 Coming out of the Royal Rumble, SmackDown featured the unveiling of Daniel Bryan’s new environmentally-friendly championship, the bizarre transformation of Rusev, a new United States champion, an elaborate backstory on Mandy Rose’s issues with Naomi, George Mizanin is proud of his son, and the announcement of the WWE title match at the Elimination Chamber event next month. NEWS OF THE DAY: Dean Ambrose gives notice and the WWE issues a statement, Raw’s viewership coming off the Rumble, Khabib Nurmagomedov and Conor McGregor fined and suspended for UFC 229 brawl, Jon Jones issued a one-fight license by Nevada for UFC 235 and KUSHIDA’s farewell match with New Japan. Finally, Wai reviews the latest episode of Total Bellas and where Nikki Bella is moving (or not moving).